*U.K. pressing. Contains 1 bonus track and 11 tracks total. 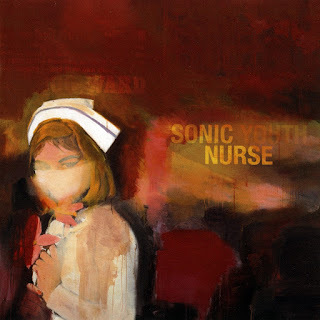 Picking up where Murray Street's languid experimentalism left off, Sonic Youth's somewhat awkwardly named Sonic Nurse shows that the band still sounds revitalized, and may have even tapped into a more fruitful creative streak than they did on their previous album. Anyone who has stuck with Sonic Youth this long knows more or less what to expect from them, but the group still has the potential to surprise; one of Sonic Nurse's biggest surprises is the return of Kim Gordon. She had a relatively limited presence on NYC Ghosts & Flowers and Murray Street, but she's back in a big way on this album, contributing four tracks; not coincidentally, Gordon's songs are among the strongest on the album. "Pattern Recognition" gets Sonic Nurse off to a strong start and ranks among her best rock songs, falling somewhere between "Kool Thing" and "Bull in the Heather" in its icy-hot appeal. Her quieter songs have just as much impact: "Dude Ranch Nurse" boasts an oddly timeless guitar lick and lyrics ("Let me ride you till you fall/Let's pretend that there's nothing at all") that blur the line between alluring and nihilistic. "I Love You Golden Blue" is another standout, a beautiful but bleak ballad with ghostly vocals that recall Nico at her most fragile. Of course, the rest of the band finds moments to shine: Thurston Moore's "Dripping Dream" begins as absurdist, angular rock (although he still has the ability to make phrases like "We've been searching for the cream dream wax" sound like the coolest thing ever) and stretches out into a beautiful epic, with the interplay of feedback and guitar lines giving it a comet-tail majesty. "Paper Cup Exit," the requisite Lee Ranaldo track, has a sharper-edged mix of noise and melody than most of Sonic Nurse. Another of the album's surprises is how much of its inspiration seems to come from the band's late-'80s/early-'90s material. It's not just that the band slams George W. Bush on the mellow protest song "Peace Attack," just as Dirty's "Youth Against Fascism" railed against the first President Bush, or that they peer into the void of pop culture on "Kim Gordon and the Arthur Doyle Hand Cream" as they did on Goo's Karen Carpenter tribute, "Tunic." On songs like "New Hampshire" -- which could pass for a lost track from Daydream Nation -- Sonic Youth actually sound younger and more enthusiastic than they have in a few albums. All told, this album is probably the band's best balance of pop melodies and avant-leaning structures since Washing Machine; even if it doesn't rank among their most ambitious work, Sonic Nurse sounds like the kind of album Sonic Youth should be making at this point in their career.